The most sustainable Nature's Notebook monitoring programs include staff buy-in, research or management questions, and engaged volunteers. 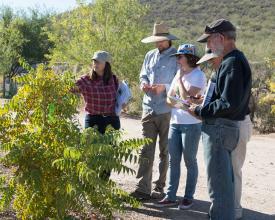 Join our Local Phenology Leader Community of Practice to share ideas and resources with colleagues. Join a growing group of active leaders who are using Nature's Notebook as an education, science, or managment project for engaging volunteers in collecting phenology observations in their communities. The Local Phenology Leader Community of Practice is a place to connect and communicate with staff at the USA-NPN's National Coordinating Office and with other leaders who use Nature's Notebook as part of their organization's programming. Communities of practice are groups of people who share a concern or a passion for something they do and learn how to do it better as they interact regularly. (Wenger-Trayner, 2015). To suggest a topic for a call complete this form. Join the email list to be notified of the monthly meeting agenda. Talk to you soon! A 10-week, 50 hour, interactive course designed to help you navigate our online materials and establish a long term phenology monitoring program using Nature's Notebook at your site. We offer two sessions a year - one in the Fall and one in the Spring. For more information visit the Local Phenology Leader Certification Course Landing Page and add your name to the list of Leaders interested in becoming Certified. We have a Facebook page and a listserv for Leaders to share ideas with each other. Please feel free to post to either of those resources. The best ideas are even better if shared! An archive of meeting minutes from our monthly calls is located on the side bar of this page. Standing meetings are the Third Friday of every month at 10 am Pacific/AZ Time, 11 am Mountain Time, Noon Central Time, and 1 pm Eastern Time. Join our contact list to receive notifications and the agenda. The next call will be April 19, 2019. We will continue to develop content for Nature's Notebook curriculum/implementation guide and resources for teaching about the visualization tool. February 16, 2018 - CitSci Day!